INK Entertainment is partnering with Tennis Canada and is pleased to offer you a discount on tickets for the 2018 Rogers Cup. The world’s best in men’s tennis are back in Toronto from August 6th – 12th. Past champions to compete include Roger Federer, Rafael Nadal, and Novak Djokovic, plus Canada’s stars Milos Raonic and Denis Shapovalov. 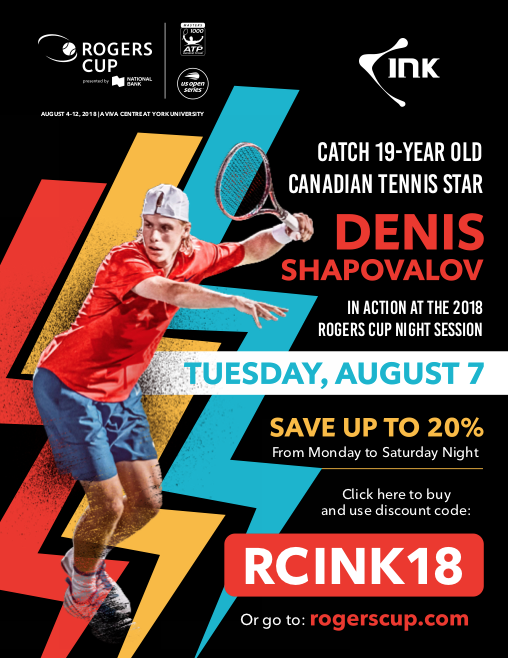 Head to the Rogers Cup website and use code “RCINK18” to save up to 20% off your tickets.